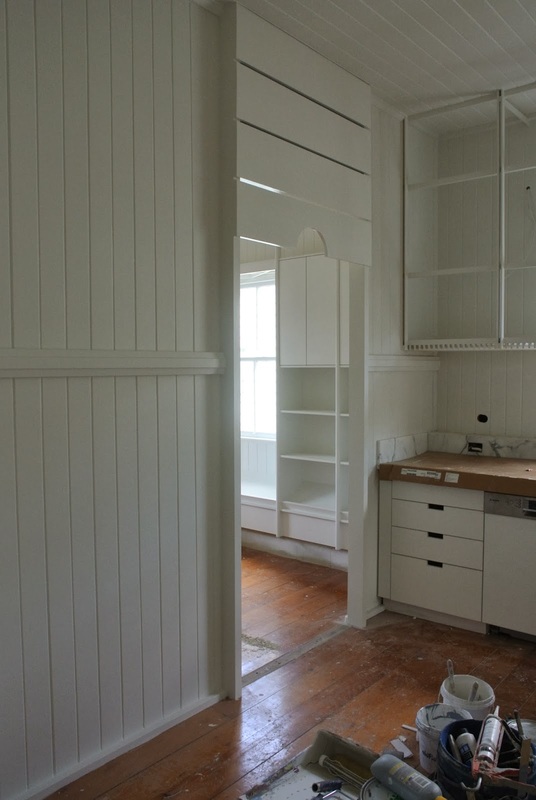 Just when Christmas kicked in and most people took some well-deserved time off, the painters kept the renovation momentum going at the West End Cottage during the holidays. But everyone is back on deck come Monday so we should see a few more of the outstanding jobs being finished very shortly - and there are quite a few to get through before we can move in. Most of the kitchen joinery has now been fitted. The marble benchtops have been sealed, but we are still keeping them covered up. A bespoke utility rack that was built some time ago has now been painted, but it's not totally complete yet. A panel of decorative glass will stretch across the middle third of the frame and will be backlit (you can see the wires protruding from the wall at both ends). You can't have too much kitchen storage I say. 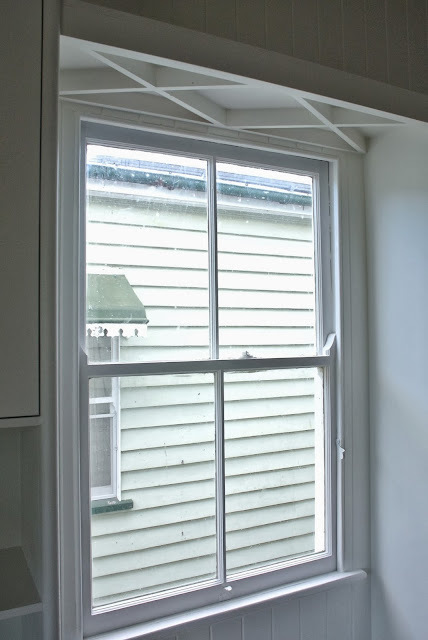 The original window on the right-hand wall was removed and replaced with an opening that leads into the scullery. As you can see we've also created an opening in the wall on the left that provides access into the Sitting Room. I've made a few minor alterations to the landscape design I put together a few weeks ago and eleven advanced trees have now been put on hold, waiting for our landscape contractor to commence and plant them into position. I've even played around with some more fort designs - this one is Option No 2, and is based on a Scandinavian-style Summer House that also mimics the rear elevation of the house. It is perfectly scaled for little people and has a large awning window that can be used for role play (i.e. shop/cafe) and also includes a loft. I'm thinking about using the above fence detail for the front fence (to replace our old falling-down picket fence which has since been removed.) The question is - should I paint it white or black? All the built-in shelving and storage is looking wonderful. I can see all the thought and planning that has went into its design. As for the front fence I do like a crisp white picket fence. 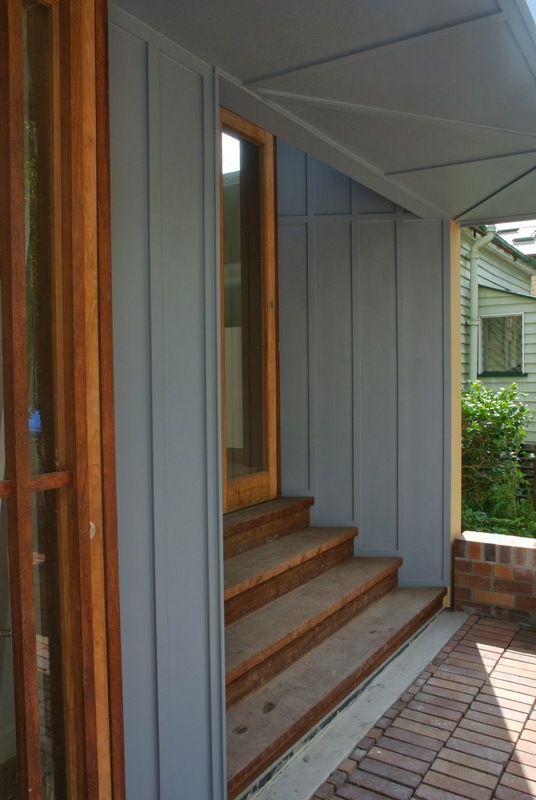 The architect has made this relatively small house work really hard. The storage options in the house are great. Looks great Caroline - a white fence would be a nice contrast to the beautiful black weatherboards. 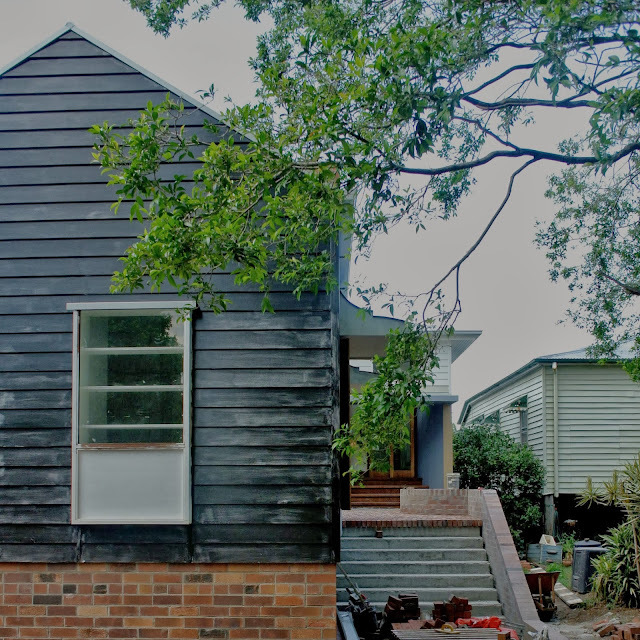 The weatherboards on the front (old cottage) are painted white - so I thought a black fence might look cool, but I'll probably stick with white. Wow I'm loving the black weatherboards, the interior is quickly coming along too. Won't be long now! I never dreamed that I would opt for black - took a little bit of convincing but I'm glad I took the plunge. When it's finished I'm sure it's going to look great. was thinking the same, white fence provides nice contrast against the black and also with any greenery that might grow in front/behind it. The reason we were toying with a black front picket fence was that it was going to tie in with the side boundary fence made (which was going to be black). Looks absolutely amazing. You must be so excited. We have a handover date for the 24th of Jan now, busy times ahead. All of that storage is amazing…and the fact that it is all so beautiful is even more amazing! This house had zero storage to begin with. We don't really have lots of furniture (great when you move around a lot) so having built-in options, including built-in banquette seat, was certainly the way to go. Thanks Anita - I've ordered an Archie armchair from Jardan (so comfy!) I'm hopeless at choosing fabrics, etc so I'm hoping that it looks good - an interior decorator I am definitely not. Hi Caroline! Your kitchen is coming along quite nicely. I’m liking option 2. I’m eager to see how it’s going to look like once it’s finished. How many options do you have lined up?